Iran is edging closer toward its goal of nuclear weapons possession and is leading the already deeply unstable Middle East region down a path to a new crisis. The warning signs are being drowned out somewhat by the horrors of the Syrian civil war and deteriorating unrest in Egypt, but they are present for any observer to see. Prime Minister Benjamin Netanyahu recently voiced his concern that regional instability is causing the international community to take its eye off the swiftly-approaching Iranian nuclear crisis. "They're getting closer" to the nuclear red line, Netanyahu told CBS's Face the Nation. "They should understand that they're not going to be allowed to cross it." Netanyahu stressed that the Israeli and U.S. clocks on this matter are "ticking at a different pace." While Jerusalem's stated red line is an Iran in possession of 250 kilograms of enriched uranium, Washington's undeclared red line is significantly further behind that of Israel's. For the Obama administration, a trigger for action would be irrefutable evidence of an Iranian order to assemble a nuclear weapon. There are multiple signals indicating that Iran is moving forward with the major components of its nuclear program, while keeping the level of its enriched uranium below a certain level to avoid triggering an Israeli military strike. Iran's nuclear trajectory is unlikely to be affected by Hassan Rouhani's election as the new president, since he must defer all decisions on nuclear policy to the country's unelected supreme leader, Ayatollah Khamenei. Only Khamenei can order the regime to cease Iran's march towards nuclear weapons, and he has clearly refrained from doing so. A growing chorus of international observers, including the United Nations' International Atomic Energy Agency (IAEA), noted that the twin policies being pursued by the United States and the international community – biting sanctions coupled with diplomacy – have failed to convince Khamenei to abandon the nuclear program. Sanctions have taken a painful toll on the Iranian economy, contributing to inflation, the devaluation of the Iranian currency, and more than halving Iranian oil exports (from 2.6 million barrels a day in 2011 to 1.1 million barrels a day currently). And yet, none of these pressure points has caused Khamenei to budge. Some defense experts in Israel have called into question President Barack Obama's assurances that he will not allow Iran to go nuclear, and suggest that Washington is on an unintended course toward a policy of containment, not prevention. Iran's goal is to anaesthetize the international community until such time that it can present itself to the world as a nuclear-armed state, and transmit the message that its new status is a fait accompli. According to Israeli assessments, Iran aims to ultimately arm itself with some 200 atomic bombs. 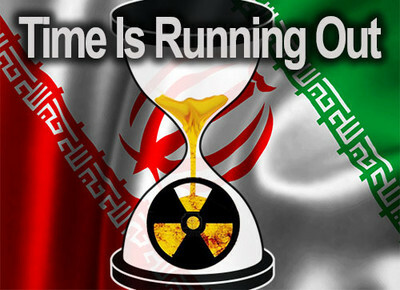 Iran hasn't yet become a nuclear-armed state, but time is running out. Iran's deviously skillful delay and deceptions, its constant nuclear progress, together with the failure of the sanctions and negotiations approach, may well force a reluctant Israeli decision to take military action sooner, rather than later. Israel views military action as the second least attractive scenario, as such a development would likely have a direct spillover effect on the entire region, which is already destabilized due to the Syrian civil war, and which is experiencing chronic sovereignty failures in several states, such as Egypt and Lebanon. A military strike on Iran would almost certainly drag Israel into a confrontation with Hizballah (now deployed in both Lebanon and Syria), and end up forcing the Israeli military to engage hostile forces on multiple fronts simultaneously, such as Gaza, Lebanon, and Syria. The Israel Defense Forces have been training intensively (as detailed below) for simultaneous, multiple-front warfare, marked by heavy rocket and missile attacks on the Israeli home front. As unattractive as that scenario is, it is preferable to an even worse development for Israeli national security: A nuclear Iran. As it engages the international community in a series of fruitless negotiations to buy itself time, the Iranian regime is carefully and consistently putting into place all of the components needed to acquire atomic bombs. Iran's steps, as confirmed by the IAEA, include: Installing faster centrifuges at its uranium enrichment facilities in Natanz and Fordow (the latter is borrowed deep into a mountain); working on a nuclear trigger mechanism at a facility in Parchin (where IAEA inspectors have been denied access for several years); and investing heavily in a delivery system, in the form of a medium and long-range ballistic missile program. The Iranians are also working on a covert, parallel nuclear program, to create atomic bombs from plutonium. The heart of this program is based at the Arak heavy water facility. And yet, when it comes to amassing enriched uranium, Iran is staying behind a red line, one Netanyahu drew at the United Nations last year. Netanyahu made clear that Israel would spring into action if Iran came to possess 250 kilograms or more of medium enriched uranium (MEU), enough material to create one atomic bomb after the MEU is converted to highly enriched uranium (HEU). The process of converting MEU to HEU is relatively straightforward and easy for a country that has mastered the production of low and medium enriched uranium. In 2012, just as Iran began to approach Netanyahu's red line, it converted 113 kilograms of its uranium stockpile to nuclear fuel, thereby stepping back from the brink, and decreasing international tensions. As of May this year, Iran began approaching the red line again, stockpiling 182 kilograms of MEU, according to the latest IAEA report. All the while, Iran's stockpile of low enriched uranium (LEU), the first and most difficult phase of a nuclear weapons program, continues to grow. Israel estimates that Iran has at least 6.5 tons of LEU. Hence, Iran is carefully calibrating its uranium enrichment levels, while moving forward in all other nuclear program fields to a phase where it can breakout to the atomic bomb phase at short notice. Publicly, Israel has signaled that the trigger for potential strike lies with the quantity of MEU in Iran's possession. However, in light of the progress Iran is making in many other spheres of the nuclear program, one cannot rule out the existence of additional, unannounced red lines, such as Iran's plutonium-based nuclear efforts. Israel is far more threatened by a nuclear Iran than the United States, for the following reasons: Its small size; the concentration of millions of Israelis in cities on the country's coastal plain; its regional proximity to Iran; and the fact that Israel is the object of an obsessive ideological-religious covert war waged by the Iranian regime against it, which has included an ambitious Iranian armament program designed to turn southern Lebanon and the Gaza Strip into rocket launching bases. Israel, the target of annihilationist Iranian rhetoric issued by top regime figures on a regular basis, has a smaller window of opportunity to strike Iran than the U.S., and would have to move earlier than Washington because of its more limited long-distance strike capabilities. The core of the Israeli defense doctrine holds that Israel cannot depend on any foreign power, even its most trusted ally, to deal with developing existential security threats. This means that if Israel misses its window of opportunity to act, it would violate a central tenet of its own defense doctrine. The very fact that Israel hasn't launched a strike yet is evidence that the window of opportunity for Israeli military action remains open.. However, daring and successful covert operations, such as Stuxnet, the most advanced computer virus in history, and the mysterious blasts that have killed key members of the Iranian nuclear project in Tehran and elsewhere, have caused temporary delays at best. Defense Minister Moshe Ya'alon warned that Israel must prepare for the possibility of striking Iran's nuclear program on its own, and called the Iranian nuclear threat "the most significant" to Israel, the Middle East and the "modern world." Israel's Minister for Strategic Affairs, Yuval Steinitz, said recently that "time is running out. We have only a few months. The danger is a global one, which will change the face of history. Iran could have hundreds of atomic bombs and hundreds of long-range missiles." The past two years have seen tighter Israeli-American coordination and cooperation on Iran. These have been led by the national security advisors of both countries, Tom Donilon and Yaakov Amidror, both of whom have recently resigned. Additionally, the recently-retired US Army's Central Command Chief, General James Mattis, told the Senate Armed Services Committee that he had no doubt Israel would act if and when Iran crossed a nuclear red line, and that it is able to do so without US assistance. Mattis also bluntly told the committee that economic and diplomatic efforts are failing. According to foreign reports, Jerusalem possesses a feasible attack plan that can cause major damage to Iranian nuclear sites, and which can set back the country's nuclear program by a number of years. The Iranian regime would be able, however, to reactivate the program and resume its efforts if an agreement with the international community to freeze future nuclear activity is not reached. Although nothing is known of the strike plan, it is possible to envisage a few possibilities. Multiple aerial routes are available for Israeli aircraft to reach targets in Iran. In any attack route, the Israel Air Force would probably have to neutralize or evade the radar systems of transit countries. According to foreign reports, the Israeli Air Force (IAF) has more than 100 F15i and F16i fighter jets that can fly to and Iran and return without needing to refuel, and which can carry large payloads. Foreign reports also say Israel possesses long-range Jericho ground-to-ground missiles, which can theoretically strike targets in Iran. Israel also possesses the advanced midair refueling capabilities required for carrying out sorties over multiple Iranian targets situated between 1,500 and 2,000 km. away from home. Possible targets include uranium- enrichment sites at Natanz and Qom, the uranium- conversion plant at Isfahan, and a heavy water reactor in Arak. Once over Iran, the IAF would need to paralyze Iranian air defenses, possibly employing advanced electronic warfare capabilities, and deploy bunker-busting bombs against nuclear sites, which are reportedly in its possession. Israeli intelligence satellites could provide real time detailed images from the battle arena, while fleets of giant Heron 2 drones, which have the wingspans of Boeing 737 commercial airliner, could carry out intelligence in Iranian skies as they hover over the launching sites of Iranian Shihab-3 missiles. Israel Arrow 2 anti-ballistic missile batteries can intercept Shihab-3 barrages from Iran (the Arrow 3 system, which intercepts incoming ballistic missiles space, is not yet operational). On the ground, Iran would order Hizballah to respond to a strike with an onslaught of rockets on the Israeli home front. Israel's solution to this threat involves devastating air force strikes using new weapons systems and a lightning ground invasion of southern Lebanon to quickly extinguish the rocket threat and dismember Hizballah as a fighting organization. Yet several unknowns remain, such as the impact a strike would have on the Syrian arena, home to Hizballah and Iranian military forces. While Israel has no desire to activate its military option, it will never agree to living under Iran's atomic shadow. Took one look at the title of article and rolled my eyes. Who wrote this garbage? I am betting a Zionist or a zionist sympathesizer. It is common knowledge that Iran wants to develop nuclear power to lessen the dependance on their own oil and gas which they want to export. All this verbiage being spewed by the media and the disgusting Israelis is a false flag. There is only one country in the middle east that profits from a distabilised region and that is the criminal state of Israel. Take a look at a map of Iran and ask who are the aggressors. And as for the arpartheid state of Israel, all western countries that persist in supporting this nazi abberation have betrayed all the people who fought nazism during the second world war. Complete support for Israel, cannot imagine Jerusalem and all the other cities under attack. It appears that the story of David and Goliath is repeating itself. Iran wants a bath of blood in order to cause the appearance of a super Inman who would then rule over a new caliphate. Every morning I watch the news here in the U.S. expecting to hear that Jewish jets are engaged in striking the atomic and ballistic missile sites in Iran. No doubt Israel will be attacked on all sides immediately as every man, woman and child fights to save our only true ally in that part of the world. Question? Will the U.S. Military under our present Administration be allowed to come to the aid of the IDF? This is a much more urgent need than Iraq and Afghanistan in which both of my sons fought. Is the U.S. & Naval Air Forces able to fly alongside our brothers? May God make it so and fight with David! The United States will wait until the first Nuclear bomb goes off, then find a way to not support Israel. It seems that the current administration needs to keep the Muslim Brotherhood happy.